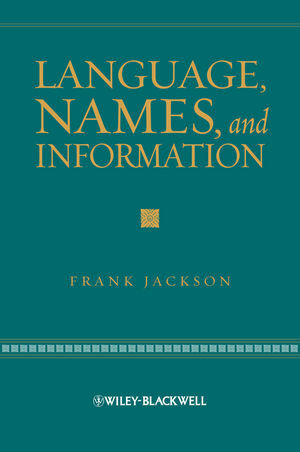 Language, Names, and Information is an important contribution to philosophy of language by one of its foremost scholars, challenging the pervasive view that the description theory of proper names is dead in the water, and defending a version of the description theory from a perspective on language that sees words as a wonderful source of information about the nature of the world we live in. Frank Jackson is Visiting Professor in Philosophy at Princeton University and holds a fractional appointment as Distinguished Professor at The Australian National University. Jackson is a corresponding fellow of the British Academy and the author of several books and papers on a wide range of topics in analytical philosophy. Lecture One: The Debate over the Theory of Reference for Proper Names. Lecture Two: Understanding, Representation, Information. Lecture Three: Ir-content and the Set of Worlds Where a Sentence is True. Lecture Five: The Informational Value of Names.